Recently, I created a logo for a weekly newsletter @whatsup, by way of her account @dramatoken, is planning on doing. The newsletter will give a weekly summary of drama in and around Steem as a way to complement her new Steem-Engine token called Drama. Although the name isn't official yet, @whatsup said the name of the weekly report would be "The Drama Report." This name is very familiar to the name of another quite famous news aggregator, called the Drudge Report. In 1995 Matt Drudge started a weekly email newsletter called the Drudge Report. A few laters Matt Drudge created a website to compliment his weekly newsletter. This website would go on to be one of the largest news aggregates on the web, with tens of millions of daily visitors, and close to a billion monthly visitors, the Drudge Report has been known to rank in the top 10 most visited websites. When I heard @whatsup was going to call her weekly newsletter "The Drama Report," I knew I wanted to make a logo for it and there was only one logo that would suit! At first, I started off trying to figure out what font family Matt used for his logo. This turned out to be much more difficult than I first expected. The font looked similar to Impact, but digging into the Impact font showed there was no Italicized version of it, and never has been as far as I can tell. This led me to think maybe it was a different, but very similar looking font Matt used. 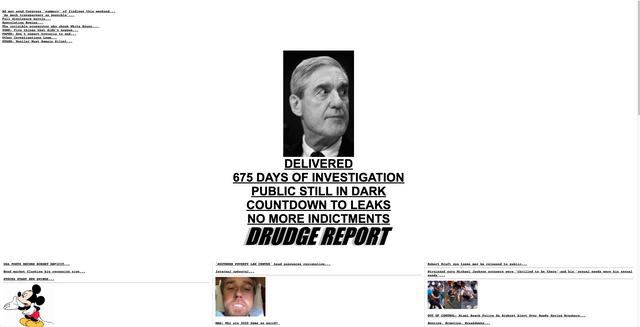 However, after digging through any number of wide, sans-serif fonts I could not find any that looked even close to the font Matt used for the Drudge Report logo. I finally decided to take a look back at the Impact font, and initial tests showed it was indeed the font Matt used in making his logo. This raised a question though, as there is no italicized version of Impact. I tried several different ways to get to be italicized through normal text-based means without success. What I discovered would finally work is taking the font into an Art/SVG editor to make it italicized. I used Affinity Designer, but I imagine other art programs have this ability as well. 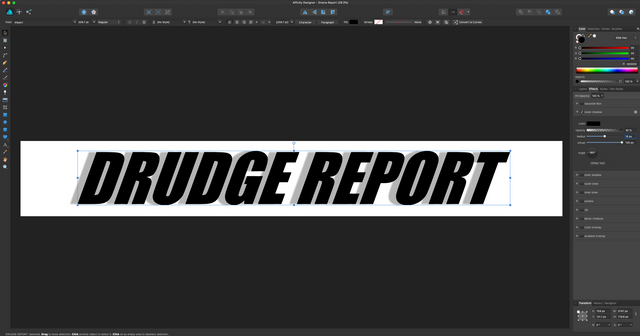 In Affinity Designer, I gave the text a 20 degree tilt to the right, which made it line up perfectly with the text from the Drudge Report logo. Then, I applied a 180 degree black drop-shadow to the left with 30% opacity. Exactly how far to tilt the shadow and what radius to give it are a bit less precise, I just aligned it so the edge of the shadow covered the edge of the "R" in Drudge, while leaving the small inlet on the R uncovered. As for the radius of the shadow, I just had to judge that by eye. This made it match exactly with the Drudge Report logo, as seen in the image above. If anyone knows a more precise way to do this, let me know so I can give accurate information. All told, the final result looks practically indistinguishable from the original Drudge Report logo, as you can see in the picture where I made it in Affinity Designer. The top image of this post is also the recreated Drudge Report logo on its own. I must admit, since Impact has no official italicized version, I do wonder how Matt achieved this back in the mid-1990's, but more power to him for having been able to do it back then! Going through the steps to recreate the Drudge Report logo actually turned out to be quite enjoyable! It's a fun challenge to dive in and figure out what font is being shown, what color scheme is used, how the drop-shadows, if any, are displayed, and more. It makes for a good way to look into how graphical arts are utilized to make good looking logos and serves as good experience for those seeking greater skills in the field!